For the past 15 years, I have been actively engaged in the development of the Muslim Lifestyle markets as an evolving global market force. Food, finance, personal care, cosmetics, pharmaceuticals, fashion, travel, the digital economy, media & recreation…These Muslim Lifestyle markets are now increasingly recognised as some of the most important and fastest growing sectors, offering major opportunities for growth. And it is the media sector, and specifically Streaming Video On Demand (SVOD), that is now at the centre of a unique convergence of 5 powerful market dynamics. Mainstream media’s insistence on portraying Islam as a threat has profound repercussions that affect all of us, Muslim and non-Muslim alike. It is not a true picture. For over 1400 years, Islam has been a creative civilising force for good, across the sciences, the arts, commerce, creativity, spiritual knowledge and personal and social development. It is now high time for these contributions, in all their colour and diversity, to be made accessible for all to see. We can help to change the global perception of Islam. The past decade has seen unprecedented growth, innovation and investment across all IE sectors…Halal food and Islamic Finance are now both valued as trillion dollar markets, and family-friendly travel and modest fashion are valued at several hundred billion dollars each. However, although valued at $190 billion, the ‘Muslim-friendly’ media & recreation sector has seen the least activity in terms of innovation and investment. And while Muslims make up over 25% of the world’s population, this sector only accounts for around 5% of the global total spend. There is clearly an opportunity for massive growth here, by tapping into an underserved market. A new emerging middle class is making its presence felt, both in the Muslim-majority countries, and among the influential diaspora communities around the world, especially in the West. Young, educated, opinionated, globally connected, socially aware, they see no conflict between faith and consumerism – on the contrary, their faith informs which goods and services they purchase. With growing disposable income, these Muslim millennials are now considered to be one of the most influential demographics, whose impact will be felt across multiple markets and regions in the immediate future. 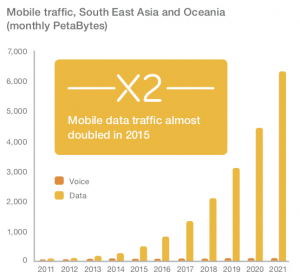 In 2015, mobile data traffic almost doubled; in 2016, data became the highest source of revenue for Mobile Operators, leaving them hungry for new data streaming content to offer their subscribers. By 2020, 50% of all video will be viewed on mobile devices. Google predict that Southeast Asia’s internet economy will become the global leader by the end of 2018, passing $50 billion, and rising to $200 billion by 2025. Home to the world’s largest and youngest Muslim population, 90% of the region’s internet users use smartphones to go online. This is our primary target market. By 2013, SVOD became the leader in non-linear, or ‘over the top’ TV viewing, overtaking advertising, rental and download-to-own revenue models. Its continuing popularity and suitability to the digital age is expected to generate 50% of all OTT revenues by 2022. And while this market has traditionally been led by North American audiences, the Asia Pacific region is on track to overtake them to become the leading SVOD market. 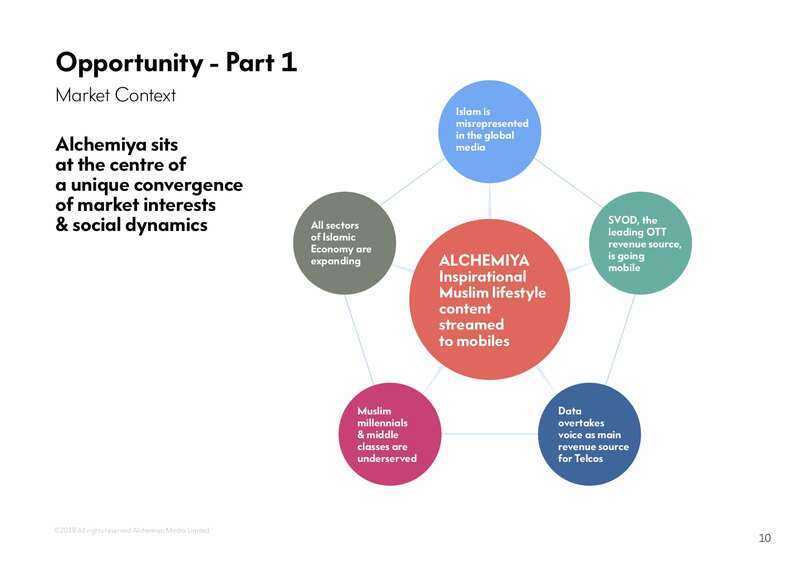 The convergence of these dynamic market forces offers a unique opportunity for Alchemiya, which sits right at the heart of these five dynamics. Alchemiya is the meeting point that encompasses these market forces. Alchemiya is riding the cresting wave of this convergence. It is an opportunity for positive change. Chief Operating officer, Alchemiya Media Ltd.
« USA: Is high-tech “clean meat” kosher and halal?